Why do emotionally distressed women cut their hair off in movies and TV? 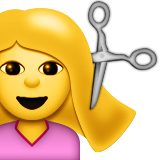 Why is it that a woman going through a significant and/or traumatic time in her life is so often denoted in film and television by a spontaneous, vigorous, tearful, cathartic haircutting scene? Frequently employed to communicate a female character’s inner turmoil or need for ‘transformation’, this cringeworthy visual convention is typically accompanied by stirring music – with or without affecting lyrics – to draw us into the gravity of the moment. But why exactly is this trope considered such an effective shorthand? Let’s pick it apart. On the one hand, shorter hair is associated with ‘the masculine’. By joining the boys’ club of buzz cuts and baldness, and thereby shedding an outward display of ‘femininity’, a woman is clearly striving for empowerment. Secondly, the spontaneous act of haircutting is irrational – like all women, who are controlled by their hysterical wombs… And appearance is everything; so if a woman is willing to change hers so dramatically in the spur of the moment, her thoughts and emotions must be in a pretty erratic place, right? The sad thing is, so many of the women whom we see cutting their hair in movies and TV are responding to some truly horrific experiences. Take Jodie Foster in 1988 drama The Accused, who cuts her hair in a fit of rage after being violently gang raped. Or Law and Order: SVU’s Olivia Benson, who gives herself a tearful makeover after being kidnapped and tortured. Isn’t reducing these ordeals to hackneyed haircutting scenes kind of trivial? What would a man do in a similar situation? Violently retaliate, or pursue justice in some tangible, rational way? Another more disturbing reading of distressed haircutting and headshaving scenes is that these are acts of penance. Bringing to mind images of ritual shaming, the female punishes herself by stripping off a source, or in fact the only source, of her power: her beauty and sexuality. It’s a point of mockery in that bastion of good taste and sophistication, Family Guy, where Peter is seen parodying Foster’s character in The Accused. We also made this essay into a video! Click below to watch our haircut supercut of 37+ women losing their minds and manes on screen. « Stephen Fry, Prison Break, Training Day & more: Watch the hottest new TV trailers, straight from the U.S.